A Snail's Eye View: Oh, bee-have! 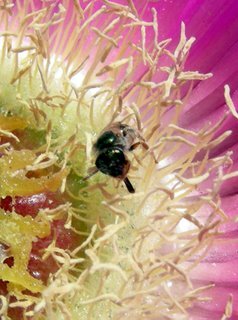 If it ever cools down again, I'm going to head down to the Carpobrotus spread at Sandy Point to take photos of native bees. This is a halictid bee, probably a Homalictus. I had problems getting the little devil in focus because it was very active, dodging between the stamens as if it were in an adventure playground. As more than one bee-lover has pointed out, I took a photo that shows no diagnostic characteristics whatsoever. This may be a record. If I get some decent pictures, I'll write more about our wonderful native bees. In the meantime, may I recommend Native bees of the Sydney region by Ann Dollin et al. 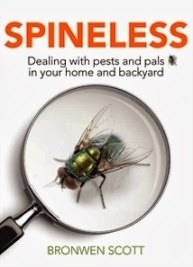 You can get a copy from the Australian Native Bee Research Centre.